The Georgia EMS Association is dedicated to helping EMTs and Paramedics who work in the State of Georgia. GEMSA is an association you can be proud to be a member of. With member discounts, educational conferences, representation on a host of organizations, the GEMSA Journal, legislative representation, other discounts, and much more, you can't afford not to be a member. The Georgia EMS Association has partnered with the Georgia Trauma Commission to facilitate the distribution of funds earmarked for coordination and delivery of approved Trauma Courses for Emergency Services personnel. The purpose of this is to provide lead instructors with the information necessary to seek approval through GEMSA for the use of these funds. The Course link will be available through the close of business on April 20, 2019 to submit your application. Get more details here. 2019 GEMSA DIRECTORS & LEADERSHIP CONFERENCE - Thanks for attending! Certificates were sent out on April 17. We apologize for the delay as we worked to set these up in our new event system. Contact Mary Napier if you don't receive one or have questions. 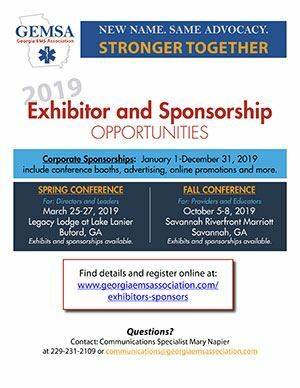 Our sponsors and exhibitors are what allows us to maintain our registration cost so we can keep the conferences affordable for EMS professionals in the state. Download our complete exhibitor and sponsorship guide for complete details on these opportunities or click on the links below. If you would like more information on corporate sponsorships or have questions on becoming an exhibitor, please contact GEMSA Communications Specialist Mary Napier. See upcoming trainings using the Training tab on our website.